On July 31, 2014, the U.S. Army Corps of Engineers (Corps) issued Policy and Procedural Guidance (Guidance) for processing requests to alter Corps civil works, including for non-federal hydropower projects under section 14 of the Rivers and Harbors Act or “Section 408 permits.” The intent of the Guidance is to establish procedures for review, environmental compliance, and post-approval requirements, commensurate to the proposed alteration. It also includes appendices with supplemental information specific to alteration of dams and construction of hydropower facilities at Corps dams. In general, the Guidance describes a nine step process for obtaining a Section 408 permit. These steps are: (1) pre-coordination; (2) a written request to the District Commander; (3) development of required technical and environmental documentation; (4) a district-led technical and environmental compliance review; (5) preparation of a summary of findings and rationale for conclusions; (6) Division review; (7) Headquarters review; (8) notice of decision; and (9) post-permission oversight of construction and ongoing operations and maintenance. The appendix specific to hydropower projects references the Corps’ March 2011 Memorandum of Understanding with the Federal Energy Regulatory Commission (FERC) for coordination of agency activities and notes that FERC is the lead agency for preparation of an environmental document for a FERC license. In a letter issued August 7, 2014, the Council on Environmental Quality (CEQ) denied a petition filed by the Sierra Club and others requesting that CEQ amend its regulations implementing the National Environmental Policy Act (NEPA) and issue guidance addressing the treatment of climate change impacts in NEPA compliance documents. CEQ stated that while it shares the requesters’ concerns regarding impacts of climate change, it believes revising its regulations is unnecessary because the Obama administration has taken many actions to ensure that climate change is addressed by federal agencies and because modifying the regulations would not be the best use of its resources at this time. Specifically, CEQ cited the administration’s Climate Action Plan initiated in 2013 for reducing greenhouse gas (GHG) emissions and preparing for unavoidable climate impacts. CEQ also cited its own actions to: develop information to assist the understanding by federal, state, and local governments and Indian tribes of climate change effects; require federal agencies to establish and meet targets for reducing their GHG emissions; and support federal agencies’ efforts to make consideration of climate change impacts integral to their planning and decision-making processes. With regard to issuing guidance, CEQ stated that it has solicited comments on proposed draft guidance, which is now under consideration. On August 8, 2014, the U.S. Department of the Treasury issued updated guidance regarding eligibility for the production and investment tax credits provided by Sections 45 and 48 of the Internal Revenue Code, respectively, to owners or operators of electric generating facilities that produce electricity from “qualified energy sources” at “qualified facilities,” construction of which began before January 14, 2014 (Notice 2014-46). Previous guidance established two tests for the beginning of construction: (1) a “physical work” test and, (2) a five percent “safe harbor” test. Both tests require continuous progress toward completion once construction has begun. Notice 2014-46 clarifies that the physical work test (“work of a significant nature”) focuses on the nature of the work performed, not on the amount or cost of that work. With regard to the safe harbor test, Notice 2014-46 provides that if a single facility is involved, the safe harbor is not satisfied with respect to any portion of the facility unless the developer incurs at least five percent of the total cost by the January 1, 2014, deadline. Finally, Notice 2014-46 provides that a fully or partially developed facility may be transferred from one owner to another without losing its qualification under either test, subject to an exception pertaining to tangible personal property sold to an unrelated transferee by the transferor. On August 4, 2014, the Columbia Riverkeeper announced that it had entered into a settlement agreement with the Corps to resolve a lawsuit it had filed in 2013 alleging that the Corps’ discharges of pollutants from eight dams it owns and operates on the Snake and Columbia Rivers in Oregon and Washington which generate hydroelectric power violated section 301(a) of the Clean Water Act. Section 301(a) prohibits the discharge of any pollutant from a point source without a National Pollutant Discharge Elimination System (NPDES) permit. Under the agreement, the Corps will now disclose the amount of pollutants it discharges into the rivers and apply for NPDES permits for the discharges. The alleged discharges at issue were pollutants like oil-water separators, greases, and lubricants from powerhouse drainage sumps and wicket gate bearings. The agreement specifically acknowledges that a NPDES permit is not required for the mere flow of water through or over any of the dams. The Corps has also agreed to notify the Riverkeeper of any future oil spills from the eight dams, and assess the feasibility of switching from petroleum products to vegetable or other biodegradable oils, among other things. On July 23, 2014, FERC issued to Sacramento Municipal Utility District (SMUD) a new license for the Upper American River Project (UARP). UARP is a 637 megawatt (MW) project on the South Fork of the American River and the Rubicon River in California, on the western slope of the Sierra Nevada mountain range. On August 20, 2014, FERC issued to Pacific Gas & Electric Company (PG&E) a new license for the 7 MW Chili Bar Hydroelectric Project, located immediately downstream of the UARP. SMUD and PG&E, which had been operating the projects under annual licenses since the previous licenses expired in 2007, coordinated relicensing of the projects and filed a comprehensive settlement agreement with a range of environmental measures for both projects. The new UARP license is for a 50 year term, and the new Chili Bar license is for a 49 year and 11 month term, pursuant to FERC’s policy to coordinate license expiration dates for projects in the same basin. Van Ness Feldman helped negotiate and seek approval of the settlement on behalf of SMUD. Now that FERC has issued new licenses for the projects, SMUD and PG&E will implement the settlement agreement, which among other things aims to balance the protection of native aquatic populations and regulate flows between the two projects. The new license also authorizes the new Iowa Hill Development at the UARP, a 400 MW off-stream pumped storage facility that was included in SMUD’s relicensing application. On August 5, 2014, FERC approved a project proposed by Free Flow Power Project 92, LLC (FFP) to test a two-year licensing process. The 5 MW project is proposed to be located at a Corps dam on the Kentucky River. The announcement is a notable step in FERC’s implementation of the Hydropower Regulatory Efficiency Act of 2013 (HREA), which directed it to investigate the feasibility of a two‑year licensing process for hydropower development at non-powered dams and closed-loop pumped storage projects. As reported in the January Hydro Newsletter, FERC’s solicitation of pilot projects to test a two-year process imposed numerous requirements, including, for projects to be located at a federal dam, a letter from the dam owner that the applicant’s plan for development was conceptually feasible. FFP was the only entity to respond to FERC’s solicitation. FERC’s approval requires FFP to conduct a number of studies typically conducted in a licensing process, including studies relating to hydraulics, water quality, fish entrainment, and endangered species. FERC’s licensing schedule envisions FFP filing a license application in early May 2015, and FERC issuing a decision on the license application by May 2016. The HREA requires FERC, no later than three years after the date of implementation of the pilot project testing the two-year licensing process, to hold a workshop soliciting comment on the effectiveness of the tested two-year process. A two-year licensing process, including pre-filing requirements, if successful would significantly streamline the licensing process for developers of new hydropower projects at non-powered dams and closed-loop pumped storage projects. 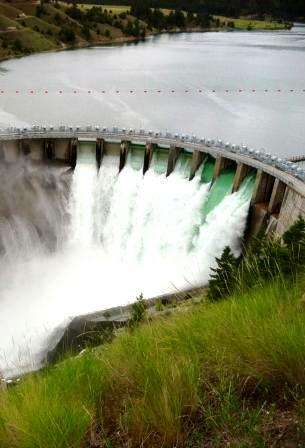 On August 12, 2014, FERC announced that licensees and exemptees of high and significant hazard dams must provide an annual statement in their Dam Safety Surveillance Monitoring Report (DSSMR) from their Chief Dam Safety Engineer or Dam Safety Coordinator that the dam is safe for continued operation. The statement must be based on FERC and licensee inspections, Part 12D reports, and instrumentation and monitoring reports. If the licensee or exemptee cannot state that the dam is safe for continued operation, it must prepare and submit with the DSSMR a Justification for Continued Operation plan and schedule to remediate the dam so it can be considered safe for continued operation. Licensees and exemptees must include the statement on safety in their annual submittal of their DSSMR beginning in 2015. On August 19, 2014, the Low Impact Hydropower Institute (LIHI) proposed revisions to its Low Impact Certification Program criteria. The LIHI certification program is a voluntary program certifying that a hydropower facility has avoided or reduced its environmental impacts according to LIHI’s criteria, which address eight key areas: river flows, water quality, fish passage and protection, watershed protection, threatened and endangered species protection, cultural resource protection, recreation, and facilities recommended for removal. A LIHI-certified hydropower facility can use its certification when marketing power to consumers, to qualify for state Renewable Portfolio Standards, and to sell Renewable Energy Certificates in certain states. The proposed revisions are designed to provide applicants with new ways to satisfy each criteria, and rewards applicants with additional years in the term of their certification if they make substantial investments in environmental measures at their facility. LIHI is also soliciting comments on the types of hydropower facilities that are eligible for certification. Currently, the program applies only to hydropower facilities that began generation before August 1998 or existing dams that added generation after August 1998, new facilities at existing dams, and conduit facilities. Pumped storage facilities, facilities located outside the United States, facilities on dams recommended for removal, and “new” hydropower facilities requiring construction of a new dam or diversion, are currently not eligible for certification. Comments are due by October 1, 2014. On August 28, 2014, President Obama announced his nomination of Colette Honorable to serve as a FERC Commissioner. Honorable is currently the chairwoman of the Arkansas Public Service Commission. If confirmed by the Senate, Honorable would replace Commissioner John R. Norris, who resigned his position as FERC Commissioner on August 20 to serve as Minister-Counselor for the U.S. Department of Agriculture in Rome, Italy. As reported in the July Hydro Newsletter, the Senate recently approved the nominations of Cheryl LaFleur and Norman Bay as FERC Commissioners. Download our full PDF containing our September and October speaking engagements.